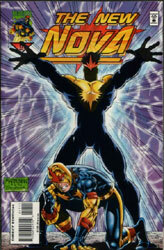 Cover Title: "The New Nova"
On the four-domed world of Xandar, Adora is doubting her recent decision regarding Nova. Borderer K'Renn, the Shi'Ar ambassador to Xandar, attempts to convince her that her decision is the best for the Shi'Ar and Xandar. Adora and K'Renn turn and return to the conference. Below the conference area, Xandarian pilots Reban and Kanan are loading surveillance spheres which are to be delivered to Earth's solar system. As Reban walks alone to find his Framii Charm, he is suddenly confronted by a large hideous creature! The creature extends its tongue and touches Reban's forehead and assumes his body! When Kanan finds him, Reban sinisterly says that he can't wait to arrive on Earth. Meanwhile, on the planet Mars, Nova gives an eulogy for his fallen friend Nova 0:0. Afterwards, he begins to feel dizzy. As he arrives back on Earth, the young hero begins to lose control of his flight powers! Nova dismisses the incident and lands at the New Warriors' Crash Pad. The Human Rocket spends the next hour using the Internet in order to find his missing girlfriend and teammate, Kymaera. As the computer searches, Rich passes out from physical exhaustion. Back on Mars, a mysterious glowing figure lands at the burial marker of Nova 0:0. The stranger's powers detect Nova's energy trail and heads for Earth. Arriving on Nova's homeworld, the figure takes solid form and smashes his way into the Crash Pad! Rich changes into Nova and recognizes the stranger's costume as one worn by a Xandarian Centurion. Nova's attacker admits he's a Centurion and that his real name is Garthan Saal! Based on his previous experience with Saal, Nova assumes his Xandarian counterpart is still insane. As the two fiercely battle, Saal (Nova Omega) informs Nova that Adora herself sent him to subdue his adversary. Nova Omega also informs Nova that he has been stripped on his rank as Nova Centurion Prime with Saal being his replacement! Nova doesn't believe Saal and knocks him through a wall. Nova is stunned to find that his hand is in great pain from hitting his foe. Nova Omega laughs as he encourages Nova to keep hitting him as it allows him to drain the hero's powers more quickly. As the battle rages on, Saal tells Nova he is being replaced due to his failure to answer Adora's emergency summons during Kraa's attack on Xandar. Angrily, Nova unleashes a gravimetric pulse at Saal only to see him absorb the blast. Nova Omega answers with a powerful punch which sends Nova hurtling into the Warriors' computers. Realizing he has no way to communicate with the New Warriors, Nova rolls with Saal's next punch in order to gain some distance. Having gaining a few minutes to recover, Nova bolts to the home of his New Warriors' teammate, Firestar. Unfortunately, her father informs him that she isn't home. Realizing he must battle Saal alone, Nova flies to a junkyard and grabs an old VW Beetle. Charging it with gravimetric energy, the young hero hurtles the car over the ocean. Saal detects the hurtling object's gravimetric energy and is tricked into thinking it is Nova. As Nova Omega follows his decoy, Nova rushes towards outer space and the Star Gate to Xandar. Arriving near Xandar, the nearly exhausted Nova turns to see Nova Omega coming through the Star Gate. The Human Rocket pushes his powers to their limits and is able to arrive ahead of Saal. Crashing into the Xandar/Shi'Ar Conference, Nova falls at Adora's feet and tells her that Saal is trying to drain him of his powers. The exhausted Earthman is stunned to hear the truth. Adora has stripped Nova of his responsibilities and powers due to his defiance of her direct orders. Garthan Saal is to be his replacement and Richard Rider is Nova no more!